The successful approach at Aqualectra had been noticed. Martina received the offer to become CEO of Fatum, a subsidiary of the Guardian Group. “I was the first local president. My assignment was to achieve growth, but we were already very strong in the Caribbean. I saw something in the Dutch market. Many Dutch companies were active in Curaçao, we were the first Curaçao insurance company that did the opposite. A good position in non-life insurance has been built up in the Netherlands. In addition, I have made a number of acquisitions. The company grew from 200 million sales to 330 and the workforce doubled.” He stayed there for eleven years, with a six-month break in 2013 when he was Minister of Economic Development and Deputy Prime Minister in the temporary business cabinet Hodge. NB. 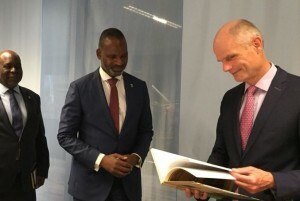 This interview is also published in the magazine CURAÇAO, a publication of the Cabinet of the Plenipotentiary Minister of Curaçao.